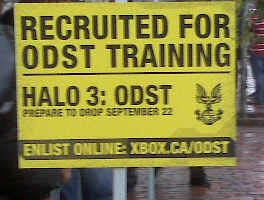 Attention Recruits are you ready for ODST Training?! What’s that?! I CAN’T HEAR YOU! ARE! YOU! READY?!?!?!?! That’s basically how my night started tonight, a couple of ODST officers yelling – in the rain – standing is a six man squad getting orders and being yelled at. After this ordeal we are rushed into another room for registration and debriefing. A quick intro to Firefight and Sargent Avery Johnson giving the pitch for joining the fight – and getting your pre-order ready. Then we are called into Action moving into a much bigger room already filling with eager recruits we are put into the path of the invading Covenant. Five stations setup for your four man squad are awaiting our attention. After killing tons of Covenant I headed over to the Media Room to hang out with Jeff Rivait – Games Manager at Xbox Canada – to catchup on the super hushed story mode in the ODST campaign. Several great new things are coming with this story. Check back in a while I’ll be updating with photo’s from the event – sadly my video is pooched and completely unusable.